A secret ingredient is sure to make this your new favorite burger. Get the recipe from BBQ Makes Everything Better. We’ve been making these burgers for years, but they didn’t get their name until we saw Guy Fieri demonstrating his burger skills on the Food Network. For his “All-American Burger,” the first ingredient he unveiled was—chorizo?!? Now we don’t claim to be the brightest knife in the box, but putting chorizo in an “All-American Burger” seemed a bit baffling. If you’ve ever traveled abroad and asked for ranch dressing, then you know why these are the real All-American Burgers. STEP 1: Place the ground beef in a large mixing bowl and, using your hands, thoroughly combine the ranch dressing mix with the meat. STEP 2: Form the seasoned beef mixture into 8 even-sized patties that are about 4 inches wide. We’ll use two 1/4-pound patties for each burger, so it’s best to make them thin. STEP 3: Place a slice of cheese on 4 of the patties. If the corners of the cheese are close to the burger’s edge, tear them off and place on the center of the cheese slice. There should be about a 1/2-inch “no-cheese zone” around the edge of the patty so that we can seal it all inside the burger. STEP 4: Stack another patty on top of the cheese and completely seal the edges where the 2 patties come together. 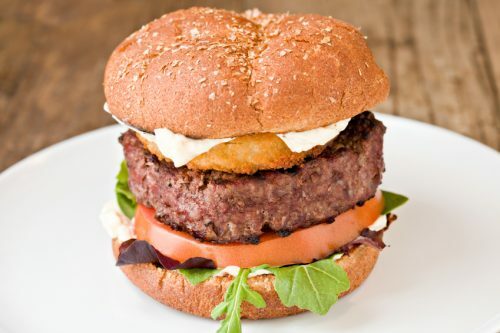 Be sure to seal the burger as tightly as possible, otherwise the cheese will ooze out during the cooking process. STEP 5: Grill the burgers over direct medium-high heat until they are done to your liking. STEP 6: Baste the burgers with barbecue sauce for the last 2 minutes of grill time. Serve on toasted buns. Barbecue, the beloved cooking method of chefs and home cooks alike, yields delicious slow-cooked, aromatic meats, charred, juicy burgers, and tender, delectable vegetables. 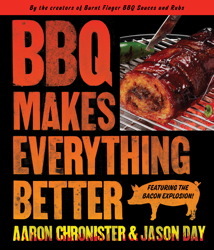 In BBQ Makes Everything Better, Aaron Chronister and Jason Day—two masters of the grill who were catapulted from their backyards to international fame with their invention of the Bacon Explosion—present mouthwatering, easy-to-follow barbecue recipes for any occasion.